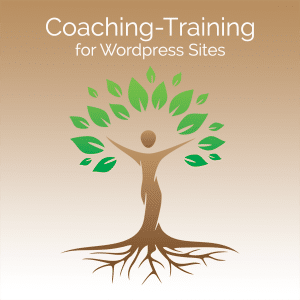 Web Medicine Woman offers one-on-one training/consulting for WordPress website owners, giving you a trusted partner on your path to success. We can meet in person or do the training via remote access demonstration or video call with Zoom or Skype. Coaching/consulting comes into play when you’d like a partner to work with you on creating social media marketing plans, creating opportunities for greater visibility of your business, working together on restructuring your site for greater impact. (See the website assessment for how this is done) and more. For the clients contracting to build a new site, I also provide content development and brand design support via video chat, helping my clients to create a brand that attracts their ideal client base and carries the oomph of their business intentions. We work together on service offering descriptions, home page and bio content and more. Some newer businesses know that they need a website to professionally present their businesses but have no idea how to begin. That’s where Web Medicine Woman Coaching services are needed! One-on-one training is the easiest way to understand the behind the scenes of your website. Sometimes you will hire someone to handle website changes for you. Or you may be a DIY-er who wants a full understanding so you can do all your website changes on your own. No matter which is your style, it’s always valuable to have a basic understanding about how your site works, especially when your site has been heavily customized. If your previous designer did not leave you with documentation, I can often create a document that shows you where to go to make your changes. Every web person out there is going to be a specialist with some WordPress tools and have general knowledge that can help with the rest. If you understand a your own site, this will also shorten the time it takes a new web support person to familiarize themselves with your site. I offer one-on-one training just for you, so you can you can learn exactly what you want to learn and cover the material and information you want and need to learn. Some site styles, especially visual page-builder sites, are harder to document, so the live training is a great refresher course. While you can you theme tutorials and YouTube videos to learn a lot, you’ll find that many of them do not fit exactly what you need, and you’ll find yourself trying to piece-meal it all together. Instead of paying hundreds of dollars for an online course that covers very little of your needs, let’s work together so you can learn how your own site works. Just as every WordPress developer will not be familiar with every theme and every site customization, the same will be true of me. So before we begin I’ll need to listen to what you need and take a look at how your site is built. If I feel that I can meet your needs, we can get started. If I can’t meet them, I will do my best to refer you to someone who can. Contact me to begin the conversation.